Published: Fri. August 4, 2017 at 2:59p.m. One thing every member of the Mahoning Valley Flight Crew has in common is a true love for craft beer. Another … a huge passion for sports. More of us tend to lean toward the teams that wear black ’n gold. But we all were thrilled with the opportunity to spend some time at the home field of the Cleveland Indians’ Class A minor league affiliate, the Mahoning Valley Scrappers, recently. 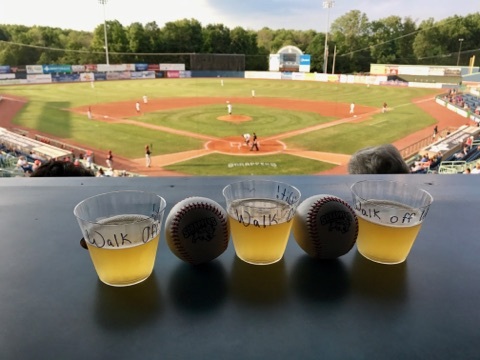 We’d heard the Scrappers stepped up their game this season with the addition of a few craft beers from Platform Brewing Co., Cleveland, and Alaskan Brewing Co., Juneau, Alaska, to name a few. When Scrappers General Manager Jordan Taylor invited us to come out to enjoy a game, we were in our glory. When he said he’d like us to try the new craft beers, we were thrilled. But, when he said we could also throw out the first pitch, we felt like we just got called up to the big leagues! Jason Jugenheimer, Joe Sanfilippo and Dave Shively got the nod as Flight Crew hurlers. While we can’t say each of them threw a strike, we can say that not one put a ball in the dirt. Nice job, guys! Once it was game time, we settled into our suite behind home plate, and the beers began to arrive. Not a bad night at all! “This is an IPA I first tried when it began to be distributed in Youngstown. I had it in a can and the temperature was cold outside. It was a good IPA at the time, but there are many others I preferred. “Skip forward a few months, and I finally sampled it again. This time, I had it on draft during a ballgame in the dog days of summer. Wow! What a different beer. It poured a nice caramel color with a citrusy hop aroma. It had a slight malt taste that transformed into a slightly bitter hop taste that resonated on the palate afterwards. “Nothing screams summer like a cold beer at the ballpark. I enjoyed the Alaskan Amber Ale, brewed by Alaskan Brewing. To the casual fan, nothing could seem more polar opposite than baseball and Alaska. As both a fanatic of baseball and this brewery in particular, I’d beg to differ. “The Alaskan Summer League attracts some of the finest college baseball players in America, to provide minor league level baseball to the NCAA’s finest. Many of major league’s baseball greats have competed in this league, which is showcased by a Midnight Game. This game is played entirely without any artificial light. That’s because during the summer solstice, it’s light outside in Alaska for 24 hours straight! Our counsel: The Mahoning Valley Flight Crew recommends getting out to the ballpark as the dog days of summer are whisked away. Be sure to take in a craft beer or two while you take in a game.